OMG! Look at this kit!!! Hey all, check out this new kit called "Debbie's Camp Hilaka" by Sherrie Piegdon from over at Pixel Gypsy Designs!!! Isn't it just fabulous!!!! I have so gotta use this beauty real soon! I really like all the elements; they are so realistic. This kit was inspired by Debbie, who is a CT over at Pixel Gypsy Designs. Actually, each of us CT members get to throw our color pallettes, ideas, and inspiration at Sherrie, and she is so graciously creating a kit for each of us, inspired by us. And you better believe these kits are going into the store!!! So go check them out!!! And this is my Emma at the Wildreness Resort in the Dells last weekend. Emma's Girl Scout Troop had a get away there, and had a complete blast. And this one that I created for my CT spot over at Pixel Gypsy Designs, for the AAM Challenge. It's certainly not too late too get in on the challenge... heck in the end you will have an awesome album about you and maybe you'll be lucky enough to win one of the many prizes!!! You can read all about the challenge here. And this one is my LO for Vera Lim's blog challenge this week. I try to participate in her challenges as often as I can, because they inspire me in a different direction then my norm. Full credits for the above LOs can be found here and here. Yep! You read it correctly!!! Pixel Gypsy Designs is having a Retirement Sale and it starts NOW!!!! that will be gone forever!!! Yesterday was full of alot of running around... I won't go into to much detail, because that's boring. I had an eye exam around noon, and got those eyes checked. My vision hasn't changed, surprisingly! I gotta figured they would have, since it's been 3 years since my last exam, but I guess I good. I did order new glasses though, because my current ones are just getting beat-up lookn'. And it's nice to have a pair that is more in with the times. The big excitement for the day, was our trip to the local Human Society. Emma was(and still is) giddy about adopting Cosmo and Martini... two very cute dwarf hamsters. Here are a few pics of the huge event. It's official!!!! Cosmo and Martini are Emma new critters! This here is a pic of Tocarra, an adorable lil' kitten that wanted to come home with us. But, kind of figured we have enough kitties in our house. And I don't think Tony would have been too happy if we added another kitty to the family. And here, we are back at home with Cosmo and Martini in their new home. It was so much fun watching Emma with new critters, and watching the kitties' reactions to them(they are very curious). And finally, here are my latest digi scraps! Full credits can be found here, in my gallery over at Pixel Gypsy Designs. Oh, and here are a couple great freebies to share with you all. This one can be found over at Gabs blog. She is having a party in celebration of 15,000 visitors to her blog. Now that is alot of visitors... crazy hah. Heck! It will the year of 2050 before my blog hits that mark. I wonder if I will still be blogging then? (Heee! Heee!) Anyhow, don't forget to read about her celbration and say thank you for such a beauty of a freebie! And this one is so darn cute, isn't it? I have so many pics that fit this kit, and can't wait to play with it! You can find it here. Please be sure an leave her some love; because it certainly deserving. Don't ya think? New designs by Sherrie Piegdon!!! Lot's of new and exciting things going on in my world and the digi world... So, much to tell you about. First off, NEW designs by Sherrie Piegdon over at Pixel Gypsy Designs! This week she added two wonderful kits, wait until you see these!!! And then "Candy's Fairy Dreams"
This week, we have a challenge that will be easy for some and hard for others, straight from the original pixel gypsy, Sherrie Piegdon. The task: Scrap a very centered layout. Keep supplies away from the edges of your page. Use one striking photo and incorporate glitter. The due date: Wednesday, June 11th, 2008. Post the link to your LO in this thread. Oh, and then here are a few more of my latest LOs. Full credits for all my LOs can be found here or here. Well, that about raps it up for today! Tah! Tah! And have a great Sunday! Taking a break at work and thought I would pop on in with a few really cool freebies! :) Take a peek at http://angelicasdigiscrap.blogspot.com/ for these fun sunburst papers! And over at http://blog.ameliescrap.com/ you can find this beauty!!! And remember, don't forget to leave these gals some luv, because it is so totally deserving! She shared a little tip on her "girls" blog this week with regards to applying realistic shadows to acrylics. After working with different techniques, Dani came up a helpful example. I know, it's not Sunday, but I had a moment and wanted to pop in with a couple of quick notes. Then I am off to an early morning dentist appointment, a doctor appointment(follow-up on my nose surgery), and then finally arriving at work around noon! Great news!!! Systems are all go over at Pixel Gypsy Designs!!!! Twenty-Fours without is was totally agony!!! I missed all the chit-chat with the girls! Well, I best scoot! Later! Well, here is Sunday again, my usually day to post to my blog. It's hard to squeeze in time to post every day, so I make sure I at least post once a week. And since Sunday is a slower paced day around my household, it's the best day to post. at the web hosting building in Texas. Apparently 1,000s of customers are without service, including a number of other digital sites, such as Pickleberry Pop, Gotta Pixel, etc. Yikes!!! Otherwise, in my life... yesterday I attended a traditional scrapbooking Crop for a Cure, with my Mom & sister Wanda. ($2,700 was raised yesterday!) It was a great time, but only got 4 LOs completed. I just find it difficult to go between traditional and digital scrappn'. I'm used to being able to manipulate pics, elements, etc. in digital and it's tough to traditional scrap then, and not be able to do all that altering of things. But, the event was awesome. Jessie does a wonderful job of pulling it all together, with vendors, auctions, raffles and food. It's all totally top notch! I was one of the lucky ones yesterday; I won a raffle, two silent auctions and a door prize. One of the silent auctions, which I won, included a Wacom Bamboo(a very nice prize!). Although, I already own a Wacom Graphire, so I really don't need it, so I may give it to my sis to play with. 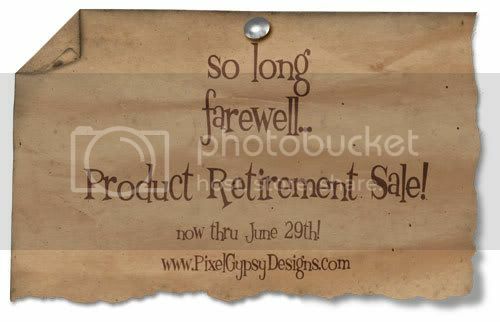 I do have a few new digital LOs to share, using a number of the new products released over at Pixel Gypsy designs. Full credits can be found at DST. Other then that, whatever happens... happens. Have a wonderful Sunday and great week! Tah! Tah!